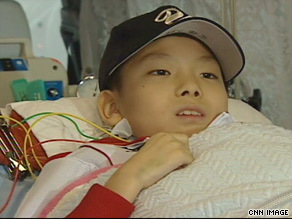 Eleven-year-old Hiroki Ando will likely die if he does not get a new heart. Hiroki suffers from cardiomyopathy, which inflames and impairs the heart. The same disease killed his sister five years ago. “We have two children in our family who got a disease that happens one out of every 100,000 people. I am sorry for my children. We are having my daughter and Hiroki going through this harsh experience,” said father Ryuki Ando. “We were told by his doctor at the end of last year that the heart transplant operation was the only way for him to survive,” Ando said. But the law in Japan prohibits anyone under the age of 15 from donating organs — meaning Hiroki can’t get a new heart in his home country. According to the web site for Japan Transplant Network, a non-governmental group that supports changing Japan’s transplant law, “this stipulation has greatly reduced the possibility of transplants to small children; heart transplants to small children have become impossible.” Lawmaker Taro Kono is spearheading efforts to change the law, which was enacted in 1997. Japan’s parliament is now debating four proposed amendments– including one that would scrap the age limit. But, beyond the age matter, the issue of organ transplantation in general, has been a difficult one for the country because of perceptions of brain death. Some refuse to accept it if their loved ones’ hearts are still beating. “For a long time, it’s the heart that mattered in Japan. Some religions ask us not to declare being brain dead as death. But that is not the majority,” Kono said. “So it is simply that we have been doing things this way and a lot of people are very skeptical about it.” Kono, who gave a kidney to his father, said a total of 81 organ transplants have been conducted in Japan since the transplant law was enacted in 1997, whereas nearly thousands of transplants occur in the United States each year. “A lot of people in Japan waiting for a transplant, waiting for a liver, a heart, other organs, most of them just die simply because they couldn’t get any organs,” he said. Kono said he believes the public supports changing the law to allow organ donation from children, noting that “when the parents of the child are going on the street asking for donations, they can actually raise more than a million dollars.” Incredibly, that’s just what Hiroki’s family has done. They started a group called “helping Hiroki” and raised $1.7 million in donations. “It was very tough to get the donations, but so many people from all over Japan donated the money,” he said. “It was not only the money, but so many letters and messages to energize us, sent to the group. We realized there are so many people supporting us, and they are the reason that we made it this far and will be able to continue after going to the U.S.” Hiroki is now at Columbia University Medical Center in New York, awaiting a new heart. His father says he knows that the transplant issue is a difficult one for families. “The honest wish from the recipient’s side is to have a donor show up as soon as possible,” he said, pausing. “I still do not know whether I can make a decision to give my child’s heart to someone else if I am faced with such a situation. But unless the people face the issue and think about it seriously, I do not think the time will come soon to see more people volunteering to donate organs.” Ando said he hopes that one day he will be able to play baseball with his son, who is an avid sports fan. “I would like to have a fun time again with Hiroki. I would like to make it home with everyone in good health,” he said. “That’s the biggest hope I have now.” Ando’s mother wrote in a blog on her Web site (http://www.hirokikun.jp/) that Hiroki was high on the waiting list for a heart transplant in New York. “I believe Hiroki will be all right,” she wrote.